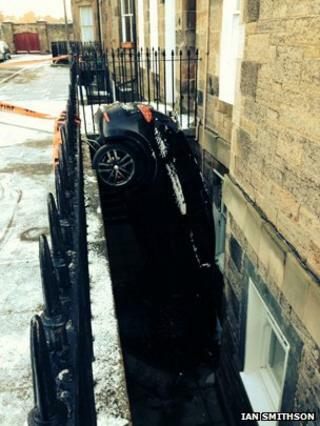 A car has skidded on ice and fallen off the road into the basement area of a building in Edinburgh. Police said the Seat Leon Cupra came off the road and drove through railings before coming to a stop, nose down, at the foot of a block of houses. The incident happened in Saxe Coburg Street at around 06:50. Nobody was hurt in the crash, but police said both the car and the property were damaged. The vehicle was removed at around noon and the road remained open. Snow and ice caused disruption across many parts of Scotland on Thursday, with driving conditions described as "hazardous". The Met Office has forecast further wintry weather over the weekend.